It's almost officially the weekend! And weekends mean brunch. Or breakfast for dinner. Pancakes. Eggs. Sausage. Bacon. Waffles. I used to think that waffles were just pancakes all dressed up. With little holes to catch the syrup. Wonderful little holes! Or to prevent you from spreading butter smoothly across the surface. Evil little holes! But then my parents gave us a Belgian waffle maker for our anniversary. YUM. Not only does the waffle iron make waffle making fun (it flips over like those ones you always see at hotel continental breakfasts), but the waffles themselves are delicious! They are crispy and light, just perfect for toppings of fresh fruit and whipped cream. This particular recipe just pops with fresh lemon flavor and gets an extra dose of indulgence from freshly make blueberry syrup. I tell you, even though the waffles are first rate, the real star of this show is the syrup. It is a gorgeous purple color and a perfect balance of sweet and just slightly tart. Preheat a Belgian waffle iron and grease lightly. In a mixing bowl, whisk together flour, baking soda, and salt. In a separate large mixing bowl, whisk together buttermilk, milk, vegetable oil, applesauce, 2 egg yolks, sugar, zest and lemon juice. In a small bow with an electric hand mixer (or in the bowl of a stand mixer), beat 2 egg whites until soft peaks form. Slowly add flour mixture to butter mixture, whisking as you do so, just until combined (don't overmix- batter should be slightly lumpy). Using a rubber spatula, gently fold in egg whites until combined. Spoon about 3/4 cup batter onto hot waffle iron and cook according to manufacturer's directions, until golden (cooking time will vary). Slowly lift lid when finished and carefully remove waffle. 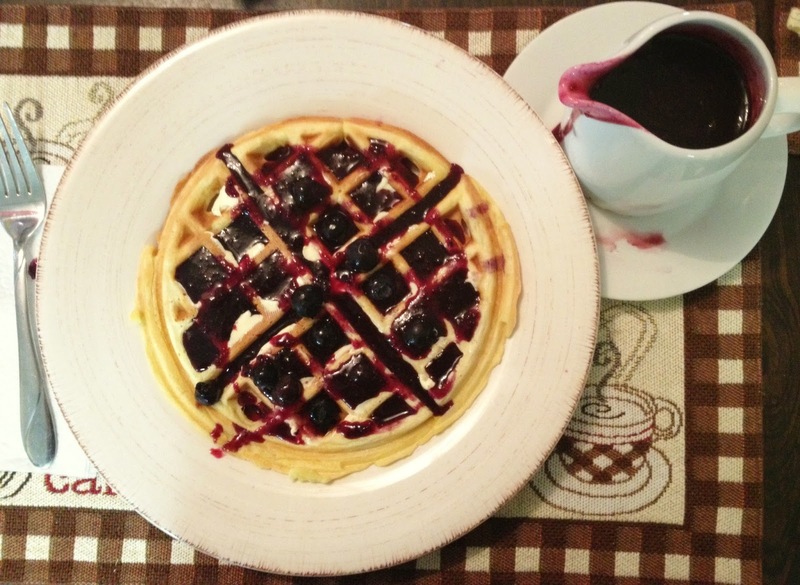 Repeat with remaining waffles and serve warm with blueberry syrup if desired. Whisk together sugar and cornstarch in a medium saucepan. 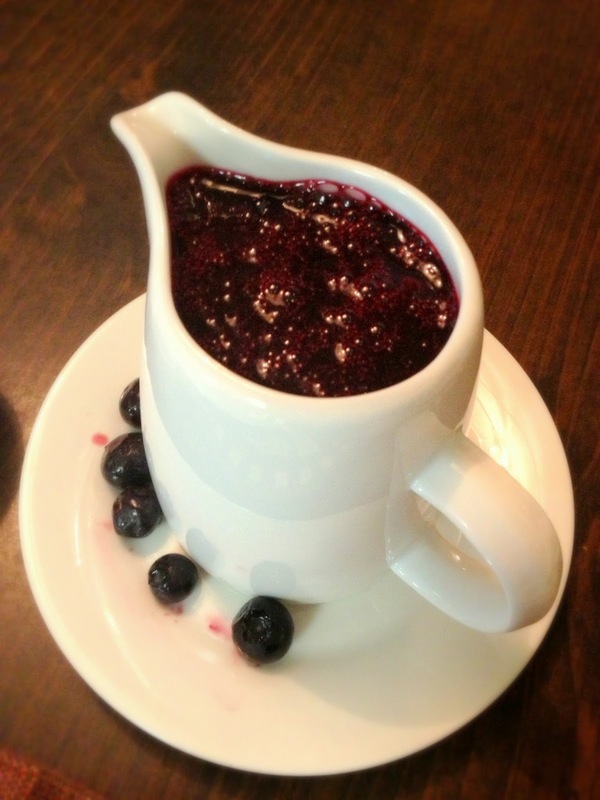 Stir in water, add blueberries and lemon juice. Cook mixture over medium high heat, stirring frequently until mixture reaches a boil. Reduce heat to medium low and boil gently for 1 minute, stirring constantly. Pour syrup into a blender, cover and blend on low speed about 1 minute or until well pureed. 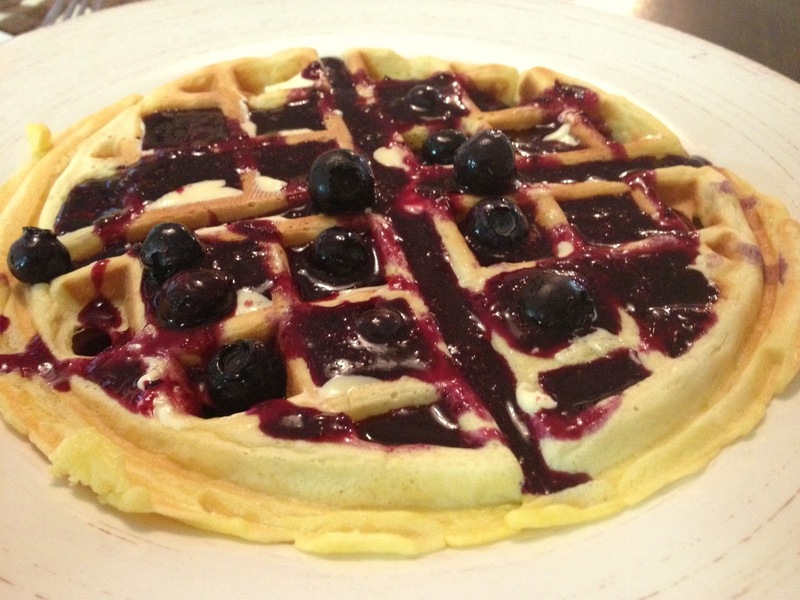 Serve over waffles, ice cream, yogurt, etc.